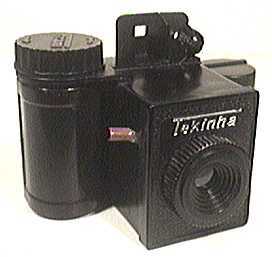 Tekinha - the most Minimalistic camera? Produced by "Produtos Eletronicos Frata LTDA." in Brazil, these models have to be the most minimalist of all 126 cameras. 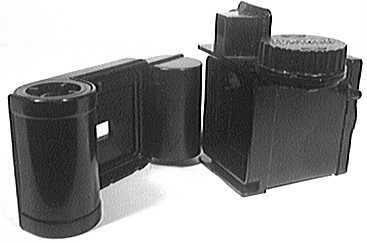 The camera itself comprises a lens/shutter housing with a direct-vision viewfinder and a film-wind knob, the 126 cartridge simply clipping onto the back to complete the assembly. There is no double-exposure interlock on these cameras, merely a sprung lever to provide an audible click when the next frame is correctly wound. The film-wind knob will even turn the "wrong" way. 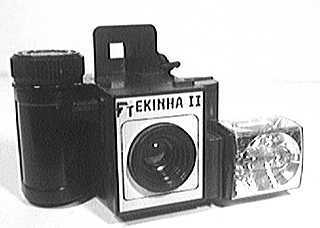 The "de-luxe" Tekinha II features a socket for a Magicube and the shutter needs to be re-cocked after each picture, providing a modicum of double-exposure prevention. A small flag protrudes from the top of the shutter housing once the shutter has been fired, as a reminder, though this is barely visible through the viewfinder. The magicube needs to be advanced manually and yes, that really is the wrist-strap tied to a hole adjacent to the viewfinder. 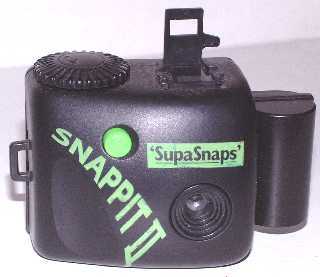 A slightly different approach was used by "SupaSnaps" in the UK, where at least the winding end of the cartridge was enclosed within the camera body. 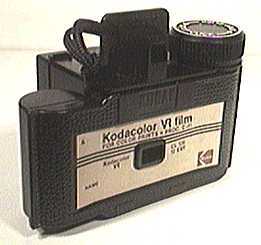 The unusual feature of this model is that the negatives are masked to 18x28mm in "landscape" format, possibly the only 126-cartridge camera not to take a square picture.